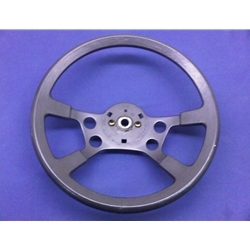 This is a factory issue steering wheel that fits any model year Fiat or Bertone X1/9 from 1979-88. This item has moulded rubber surround with black painted basket. Does not include horn button assy. Stock photo used for this item. Very firm rubber surround, Basket is unbent, and painted finish is in good shape. Horn contact plate is undamaged.